DiQuIt is a Graphic User Interface (GUI) of a postgresql database with the information in the file runasimi.txt downloaded from RUNASIMI.DE. The interface has been developed in tcl/tk. Note: I chose Hanan Runasimi because it is the official writing for the Quechua-Qullaw in Peru and is a standard that combines the Quechua of Cuzco with that of Ayacucho. The alphabetic system is trivocalic. In the future, I plan to add other dialects of the file and provide the user the possibility to change them realtime. Similarly, I'm going to expand the translation languages to Spanish and English. 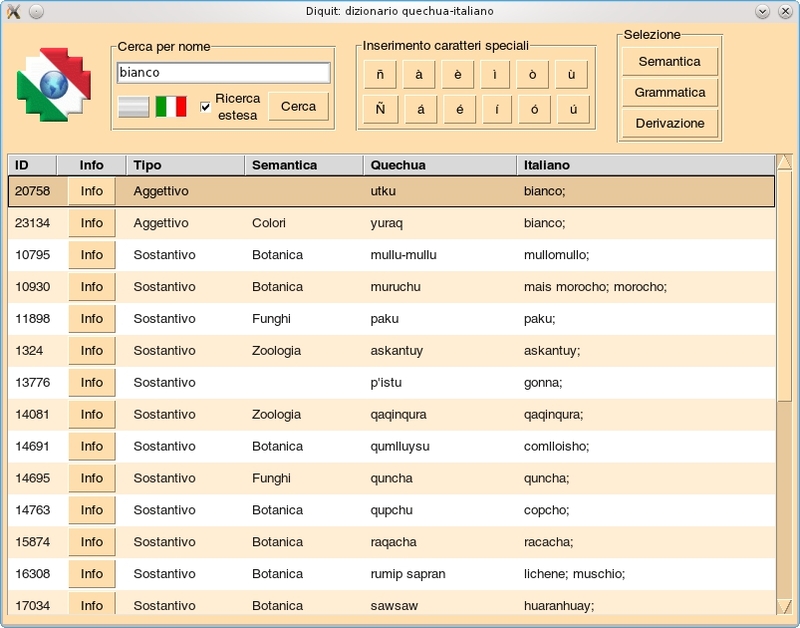 it is possible to search words in Quechua or Italian, possibly grouping them by grammatical category, semantic category or linguistic derivation. when active, the word is searched in the notes associated to other words. 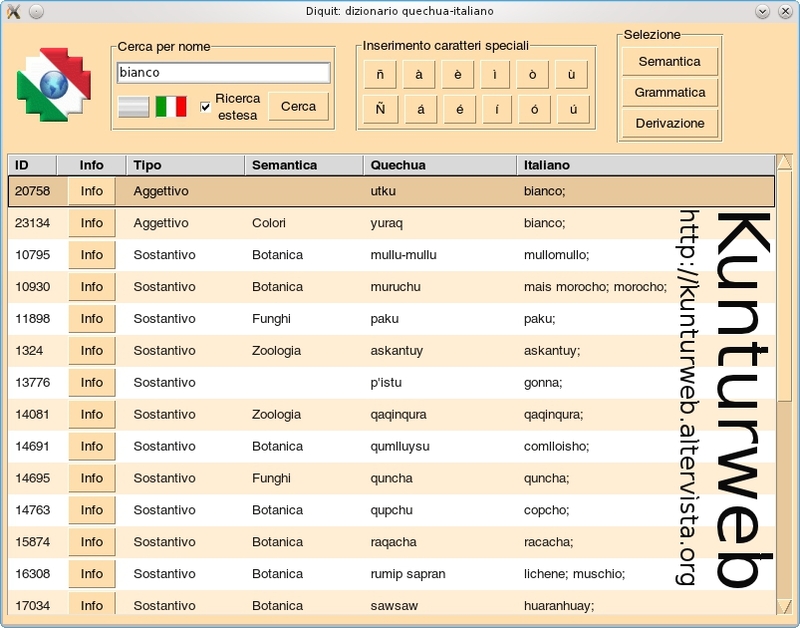 this function allows the user to view information about the searched word (possible translations, synonyms, taxonomy, notes). by entering a number from 0 to 1000000 (a milion), the program can translate it into Quechua. by entering a verb in quechua and specifying the options (tense, negation, ...) the program can combines the verb in the seven forms or in the impersonal form. learning of words related to some topics is facilitated by the presence of cards (forms of greetings, numbers, calendar, astronomy, shapes and colors, ecc...). 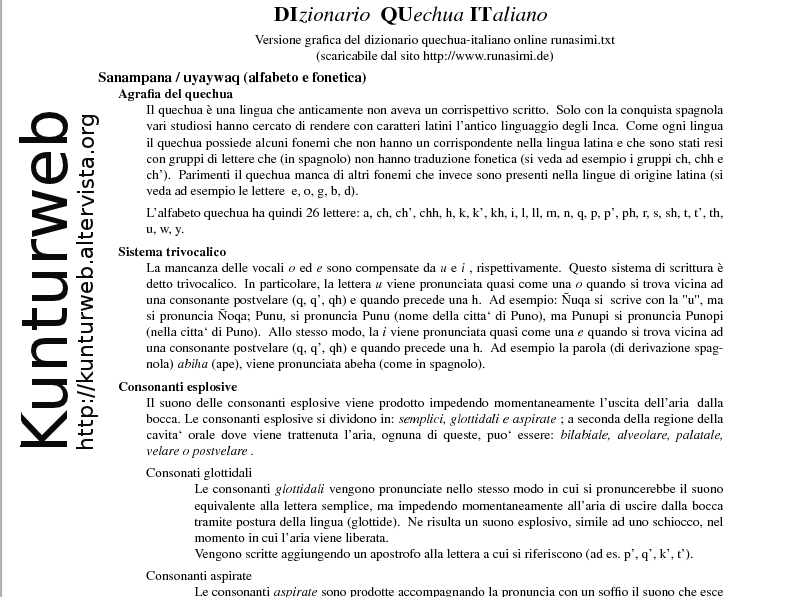 You can check your progress through a series of exercises based on the learning cards, both from Italian to Quechua, and from Quechua to Italian. The installation of DiQuIt is quite complicated and the Gnu-Linux O.S. is required. Besides a pre-configuration of postgresql database is required too. In order to make the program accessible to the largest number of users, I decided to put DiQuIt on a GNU-Linux Live Distro, installed on a USB stick or CD-ROM. The distribution is almost ready: I am working on some technical details and license, then I will publish it on this site. Where can I download DiQuIt? 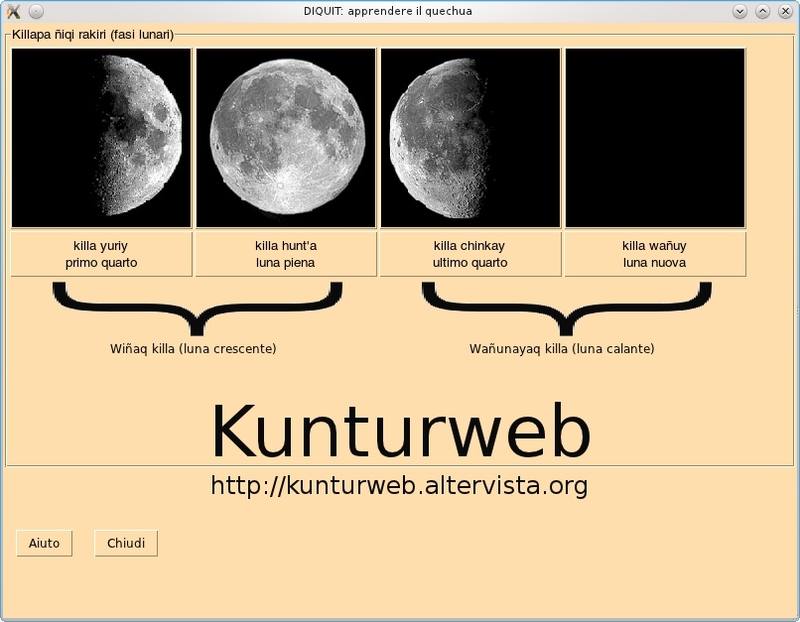 DiQuIt is included in the Gnu-Linux distro Kuntur GNU-Linux which will be freely downloadable from this site in a meanwhile. Kuntur GNU-Linux is a Gnu-Linux distro based on Ubuntu and thought to work on the mayority of PC (my hope also on the old ones). How much does DiQuIt or Kuntur GNU-Linux cost? DiQuIt (and Kuntur GNU-Linux) is free (gratis). Are You planning to develope a Mindoms version of DiQuIt? What's Mindoms? Sorry, I haven't ever heard about it! ;-) DiQuIt is thought to be portable as both Postgresql and Tcl/Tk can work also in other environments and O.S., but I am not going to release DiQuIt under other O.S. I saw that DiQuIt translates from Quecha to Italian an vice versa, but is there a version of it that can translate from Quechua to Spanish or from Quechua to English? I am going to add the other translation languages that are in the file runasimi.txt, but as I have little time to dedicate to DiQuIt, I prefer to correct any mistakes and add new functions; then I will add other languages.